President John F. Kennedy assumed office on January 20, 1961, following an eight-year career in the Senate. The first Catholic president, Kennedy was also the second youngest to ever serve in the office. In his inaugural address, Kennedy proclaimed “Let every nation know, whether it wishes us well or ill, that we shall pay any price, bear any burden, meet any hardship, support any friend, oppose any foe, in order to assure the survival and the success of liberty.” Kennedy came into the presidency determined to reenergize the foreign policy establishment. To that end, he assembled a team of young White House and National Security Council advisers—the so-called “best and the brightest”—which included McGeorge Bundy, Walt Rostow, Ted Sorensen and Arthur Schlesinger, Jr.
Kennedy selected Dean Rusk, a taciturn Southerner and president of the Rockefeller Foundation, as his Secretary of State. Respected within foreign policy circles, Rusk had served in several positions at the Department of State, including Deputy Under Secretary of State and Assistant Secretary of State for East Asian and Pacific Affairs. Rusk believed that the Secretary of State served at the pleasure of the President and thus did not seek control of foreign policy. Kennedy selected Robert S. McNamara, the president of Ford Motor Company, as his Secretary of Defense. Harvard dean McGeorge Bundy served as his National Security Adviser. The Director of the Central Intelligence Agency, Allen W. Dulles, continued in that position, which he had held since 1953. The Kennedy administration inherited the containment doctrine of the 1940s and 1950s, and maintained the belief that Communism was a threat to the United States. However, the brinksmanship of the Eisenhower era seemed archaic to the Kennedy idealists in their new international vision. Kennedy implemented the “flexible response” defense strategy, one that relied on multiple options for responding to the Soviet Union, discouraged massive retaliation, and encouraged mutual deterrence. In April 1961, a short few months into his administration, Kennedy authorized a clandestine invasion of Cuba by a brigade of Cuban exiles. The CIA covert operation had been formulated and approved under President Eisenhower. Relying on faulty intelligence, the operation collapsed in two days with the defeat and capture of anti-Castro forces at the Bay of Pigs. The spectacular failure of this Cold War confrontation was a setback for Kennedy, and one he became determined to overcome. Though he took full responsibility for the failed operation, the CIA’s reputation was tarnished and Kennedy soon replaced DCI Allen W. Dulles with John A. McCone. Similarly, the Bay of Pigs fiasco affected Kennedy’s respect for the advice of the Joint Chiefs of Staff, placing a strain on the civil-military relationship that would remain under stress throughout the administration. McNamara’s management reforms in the Pentagon, the administration’s focus on counterinsurgency warfare, and finally the policy toward the war in Vietnam all found the uniformed military leadership in disagreement with the administration. Tensions with the Soviet Union dominated U.S. foreign policy. Kennedy first met formally with Soviet Premier Nikita Khrushchev in June 1961 at the Vienna Summit to discuss Berlin, Laos, and disarmament. Ailing and unprepared, Kennedy came across as an inexperienced adversary to his Russian counterpart. The two continued a series of both formal and public exchanges as well as more informal and very confidential exchanges—the “pen pal” correspondence. The channel was intended to give the two men a chance to informally exchange ideas under the heightened pressure of the Cold War. Still, the construction of the Berlin Wall in late 1961 and the military standoff between U.S. and Soviet troops there kept both nations on high alert. The Cold War reached a frightening apex when in late 1962 the Soviet Union gave the Cuban Government medium-range ballistic missiles to defend against another U.S. invasion. American intelligence photographed Cuban missile sites, leading to a naval blockade and quarantine of Cuba. The tense thirteen days of the Cuban Missile Crisis tested the mettle of the Kennedy administration and his team of trusted advisers. Khrushchev agreed to remove the missiles, averting nuclear war, but resolving little between the two nations. Kennedy avoided war in Laos, rejecting a military proposal to send American troops to fend off a communist insurgency there. However, he authorized sending troops and military advisers to the U.S.-backed nation of South Vietnam and steadily increased their numbers throughout his presidency. The administration was determined not to lose either the nation of South Vietnam or the broader region of Southeast Asia to communism, cementing its military commitment to Vietnam. 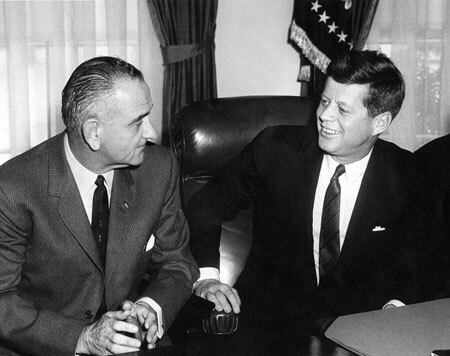 Kennedy’s assassination in November 1963 brought his Vice President, Lyndon B. Johnson to the presidency. Dean Rusk continued to serve as Secretary of State and stressed to the new President the necessity of continuity in foreign policy. President Johnson vowed to the nation that it would keep its commitments “from South Vietnam to West Berlin.” Johnson retained Kennedy’s close group of advisers and the National Security Council under Bundy continued to prove vital to foreign policy decision-making. Walt Rostow replaced Bundy as National Security Advisor in 1966. President Johnson continued the U.S. military commitment to South Vietnam. Escalation followed with the August 1964 Gulf of Tonkin Resolution, which authorized Johnson to take any measures he believed were necessary to retaliate and to promote the maintenance of international peace and security in southeast Asia. Johnson won the landslide election shortly after. In early 1965, the U.S. military launched Operation Rolling Thunder, a bombing campaign against the North. Shortly after, Johnson introduced U.S. ground combat forces with the landing of Marines at Danang. By 1967, nearly 500,000 troops were in Vietnam. Following the Tet Offensive in 1968 and facing dwindling public support for the war, Johnson announced that he would not seek a second term as President. Though preoccupied with Vietnam, the Johnson administration faced challenges elsewhere. In Latin America, riots in Panama in 1964 led to concessions that still preserved U.S. control of the Panama Canal. In an unpopular move, Johnson sent troops to the Dominican Republic in 1965 to intervene in their civil war and prevent another Cuba. Tensions flared in the Middle East in 1967 during the Arab-Israeli War. Johnson warned that the United States would oppose aggression by any state in the area but encouraged diplomatic negotiations. In 1968, the administration faced another major crisis when the Soviet Union led Warsaw Pact troops in an invasion of Czechoslovakia. The Soviet crackdown tested détente, but both powers avoided confrontation. Following the election of Republican Richard M. Nixon, Johnson left office on January 20, 1969.